This weekend marks the 86th annual meeting of the US Conference of Mayors. We took a look at important issues facing cities to see which mayors across the country are most vocal on the issue and how the conversation has evolved over the past year since the 2017 annual meeting. 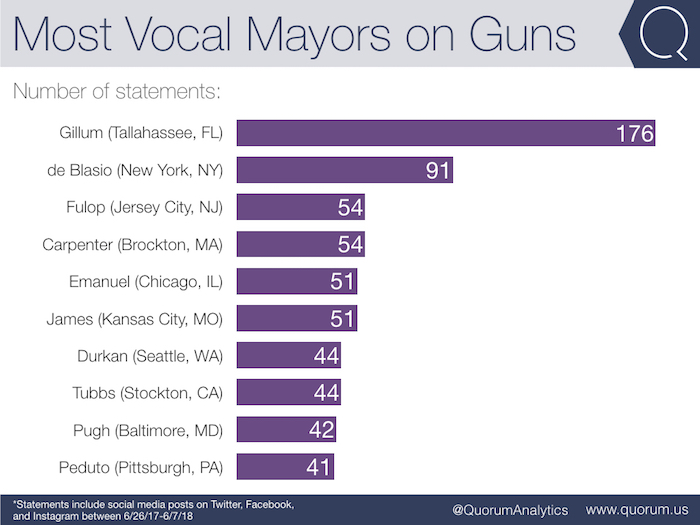 Mayor of Andrew Gillum of Tallahassee, FL is the most vocal on guns. 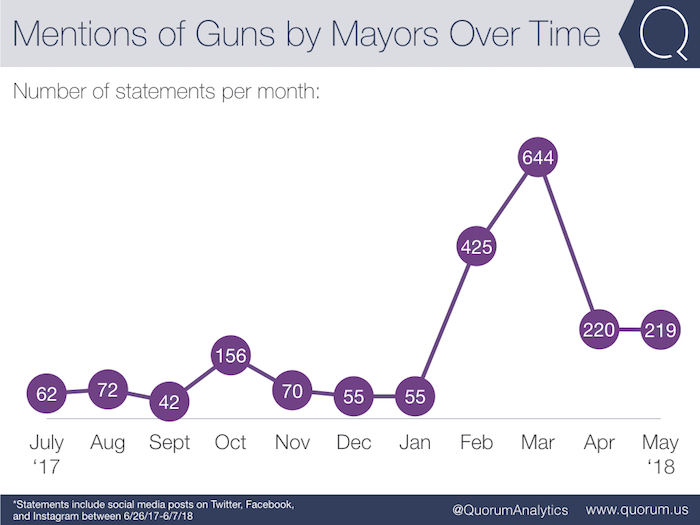 Following the Parkland shooting, February and March brought a surge in dialogue on guns by mayors across the country. As the gun debate in the Florida legislature took hold, Mayor Gillum of Tallahassee emerged as the most vocal mayor in country on guns. Gillum has mentioned guns nearly twice as much as the second most vocal, Bill de Blasio. 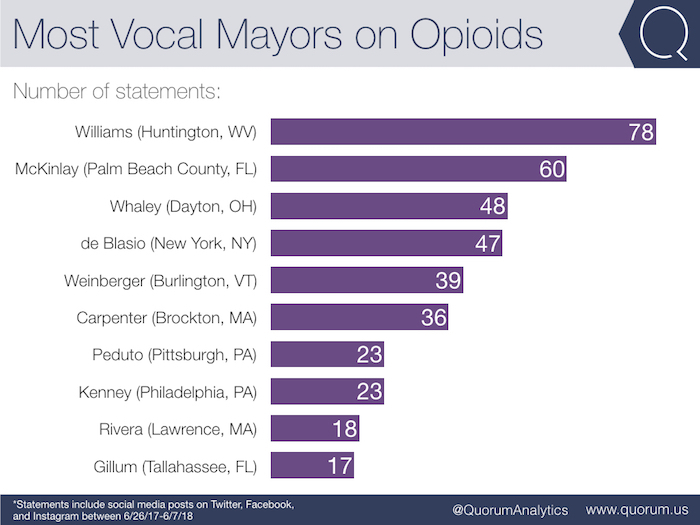 Mayor Steve Williams of Huntington, WV has been the most vocal on opioids in the past year. Mayors in Rust Belt and East Coast cities dominate the conversation on opioids. 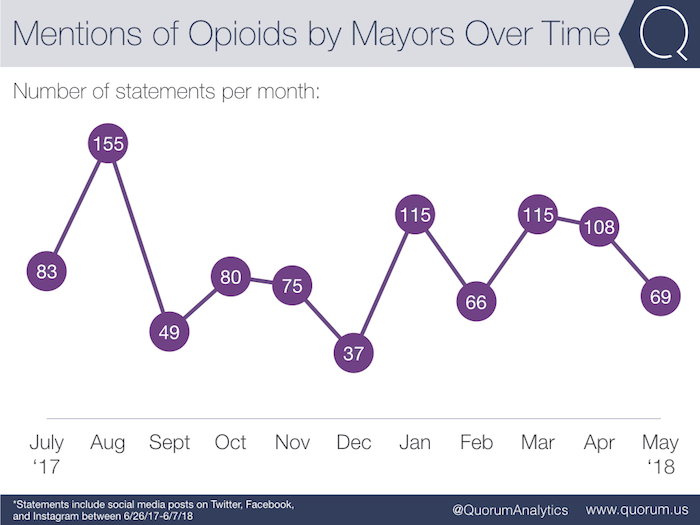 August marked a significant spike in dialogue on opioids among mayors, when President Trump announced that he planned to declare the opioid crisis a public health emergency. 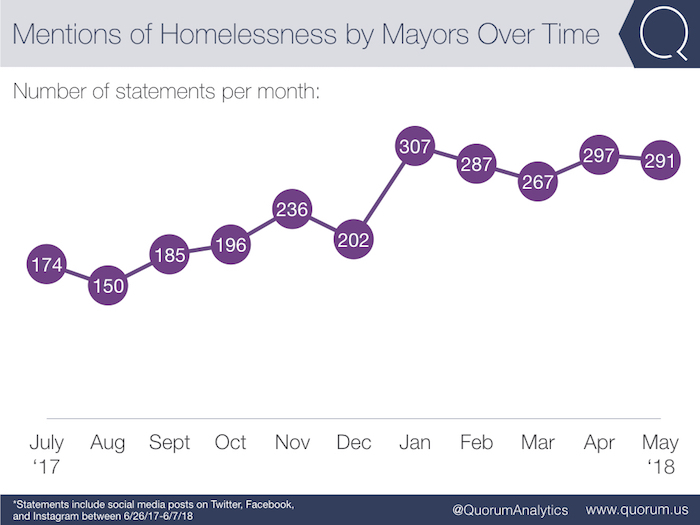 Six of the ten most vocal mayors on homelessness are from California. Mayor Eric Garcetti of Los Angeles is the most vocal with 192 mentions. 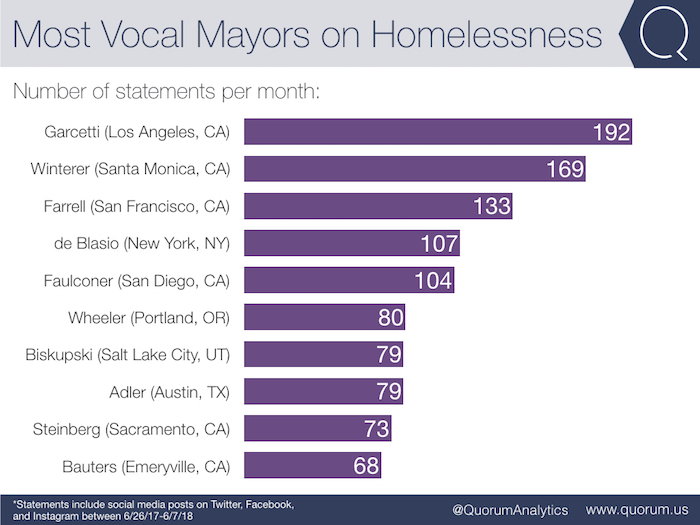 Along with representing six of the top ten, each of the top three most vocal mayors on homelessness are from California—Garcetti of Los Angeles, Winterer of Santa Monica, and Farrell of San Francisco. New York's Bill de Blasio is the only East Coast mayor to crack the top ten. Public affairs professionals should have modern software built for them. Request a demo today to learn why. Quorum is software built for public affairs, providing one place for stakeholder engagement, legislative tracking, and grassroots advocacy. Sign up to receive best practices and product announcements. © 2019 Quorum Analytics Inc.
Quorum Analytics is not affiliated with, licensed, endorsed, or sponsored by Leidos Innovations Technology or its affiliates.